Technology devices. Across the globe, most people have one. It may be on your desk, on your lap, or in your pocket. You can use these devices for social media, taking pictures, banking, shopping, research, communicating with others, and much more. The Internet of Things, allowing you to run your security system, household appliances, and other options, once only available to the rich and famous—now it is available to the average consumer. Technology will continue to evolve—it is not going to go away. Why is this certification so important and what can it do for you? 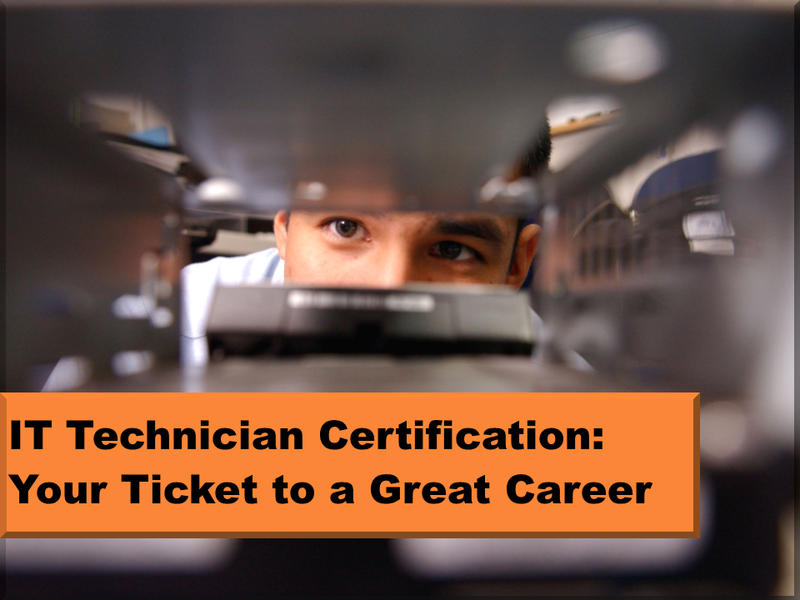 Posted in IT Training & CertificationTagged Arizona, career, certification, CompTia, computers, Dynamic Worldwide Training, information technology, IT, job hunter, job seeker, networks, Phoenix, technologyLeave a Comment on IT Technician – Your Ticket to a Great Career! Today’s job market is tough—and that is not going to change in the foreseeable future. Many professionals with managerial and leadership skills are finding that the experience they have as leaders does not carry the prestige as it once did nor does it always translate into finding that next job. 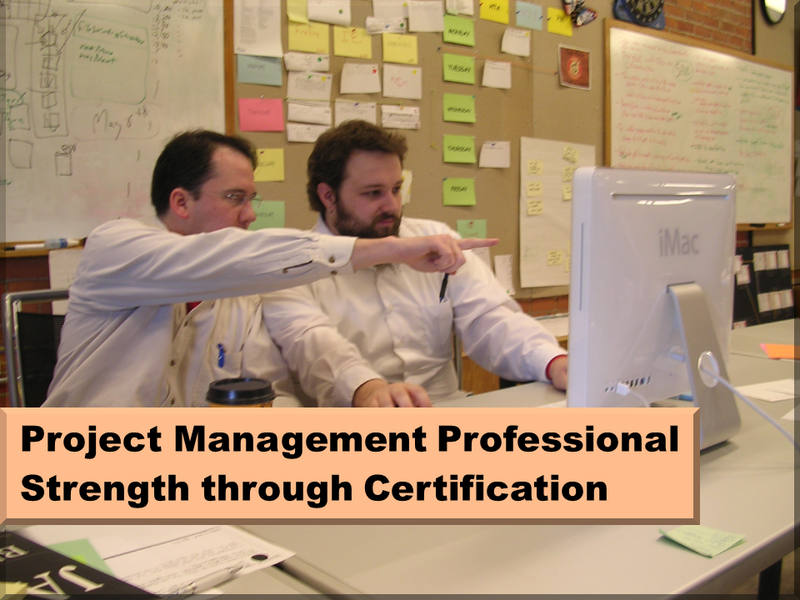 Now, it is no longer acceptable to just have managed projects as part of your leadership role, you need to have achieved the Project Management Professional (PMP) certification as well. With a job market that has more professionals seeking work than there are professional positions to fill, having certification along with experience is essential to carry you to the next level along your career path. For my first posting we will discuss Application Security and securing social media (remember to update all the applications on your systems not just the operation system). Here is an example why; Adobe had a few patches out on 1/14/14 for Acrobat and Reader, at least 1 is considered Priority 1, and the other is an updated FLASH player for all platforms. 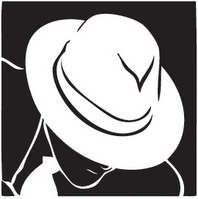 The vulnerability patched closes a hole in Flash, which if exploited, allows an attacker to remotely access to your system. Yes, that means they could remotely control your system and take anything they want. Compare this to leaving your front door open with a sign saying “Take whatever you want”. Except the victims may never even realize that it is happening. To follow-up on our last posting on hacked social media accounts, yes, they are targeted and Facebook, Skype and Linked-in have all fallen victim to hackers, but those are just the BIG attacks that took thousands of focused attackers. The difference is that your account could be targeted and it would never get reported. Security Tip: You don’t have to put your real birthday, age, address etc. in those accounts. I know somebody just read this and thought; “blasphemy!” how could you lie to Mark Zuckerberg, the poor guy is just using your information to make a buck, or two. I realize you might not get all those great “Happy Birthday” messages that you are found of but you could just get them twice a year, once on your real birthday and once one your Facebook birthday! Remember, if you think there are unscrupulous people out there trying to get your information, you are not paranoid, you just may be a little more aware of what may be going on behind the scenes. As we just learned from Cyberdefense specialist Aamir Lakhani, Robin Sage social media attacks are alive and well. By creating a fake social media account under the name “Emily Williams” and tricking government personnel into accepting his requests, Lakhani, a penetration tester for World Wide Technology, gained access to passwords, sensitive documents, and even the computer of the head of information security at an unnamed government agency. It took only 15 hours for Lakhani to gain over 55 connections to his targets via Facebook and Linkedin. After a short time, male employees offered to help “Emily” get a laptop, and, most surprisingly, offered her a job and gave her early access to their network. Read more about this penetration testing attack. One would think that national security professionals would be more careful about who they allow into their social networks. This latest example shows how vulnerable our data networks are to these types of attacks, and underscores the value of comprehensive cyber security training programs. 1) Avoid allowing unknown people into your social network. Often users tend to spend too little effort to ensure that the friendship requests are from actual friends. It’s been shown that 78 percent of all Facebook users use the number of friends they have in common with their current friends as the most compelling reason to accept an incoming friendship requests. Google Image search can be used to help validate unknown social media requests. We all know about Google Images, but do we all know about Google’s reverse image search engine? It’s a service that allows users to search by images. No, that isn’t search for images per se — it is search by images: you input an image URL or upload an image, and then Google finds similar looking images. Although the service may sound simple, it can be very useful. Let’s say you have a profile picture of a person and you want to verify that they are who they claim to be. Simply copy their picture to your desktop, drag it into the Google Image search field and there you go. It either verifies their identity or you may find yourself in the middle of a catfish attack. A catfish attack is when an individual pretends to be someone they’re not, like in the case of “Emily Williams”. We can use Google Image search as a quick counter measure to those attacks. It is a great tool for confirming someone’s identity on Facebook, LinkedIn, Social Dating sites, and any other venue in which a friendship is established based on a profile. 2) A social media network is only as strong as its weakest link. Be aware of connections in your network that may be compromised – even real associates or friends may be allowing bad actors in their network to view your data. If your friend hasn’t checked the authenticity of the friend request prior to accepting it and you’re approached by the same person, you may be dealing with a hacker. 3) Stress the importance of social media security awareness. There are few technologies out there that will protect you from threats coming through social media. User security training is the best way to fend off attacks. Everyone can fall prey to social media attacks, even the very cyber security-savvy professional as evidenced by Lahkani’s research. About Scott A. Wells, Ph.D.
Dr. Scott Wells is recognized throughout the industry as a world-renowned instructor and consultant known for his commanding presence in the classroom and breadth of knowledge in the world of Information Technology and Information Security. Dr. Wells achieved his doctorate in Applied Mathematics (Cryptology) and has worked for and consulted industry leading corporations such as Microsoft, Digital, and Cisco as well many other Fortune 100 companies. For the past 12 years Dr. Wells has developed and taught hundreds of Information Technology and Cybersecurity training programs for the Department of Defense, Federal Agencies and Fortune 500 enterprises. Dr. Wells leads the initiative to establish Ultimate Knowledge Institute as the industry leader in providing Social Media Security, Forensics, and Governance training as well as a renowned certification body awarding cybersecurity experts with the Social Media Security Professional (SMSP) Powered by CompTIAcertification, the Social Media Engineering & Forensics (SMEFP) and Social Media Management & Governance (SMMGP) certification. At Dynamic Worldwide Training consultants you can take any of our IT and business career training courses from the comfort of your home or office in “real time’ via REAL-ILT. (Instructor Led Training). We send the student a camera and headset so they can easily take part in the class even though they’re miles away – at no additional charge! It uses SMARTBoard interactive whiteboard technology so students can watch and interact with the instructor virtually in real time. We are located in Phoenix, AZ (MST) so keep the time zones in mind. These are some of the courses and certifications we offer: Microsoft Networks & Office, Juniper Networks, CompTIA, Cisco, EC-Council cyber security, Dell Force10, Citrix, PMI, VMWare, business skills like social media marketing and business change agent. Click on Courses to see a list of the IT certifications and other business courses that we offer. FULFILLMENT: You feel personal satisfaction about your educational accomplishment. A series of positive events accumulate and provide a sense of satisfaction. Effort put into learning and expanding personal growth through solid education enhances professional accomplishments. It is said that the two accomplishments that we point to with pride are jobs and education. VALIDATION: Certification validates and affirms your work ethic and pursuit of success. IT leaders today are struggling to find qualified, certified people, according to a survey done by IDG Research. Further research shows that 8 out of 10 HR professionals believe IT certifications will grow in usefulness and importance over the next few years. PREPARATION: Certification is an inexpensive way to show employers that your skills are up to date. There can be many barriers to continuing your education but money shouldn’t be one of them. The certification process is relatively inexpensive in comparison to community college or university choices and it improves the chances that an employer will pick YOU. 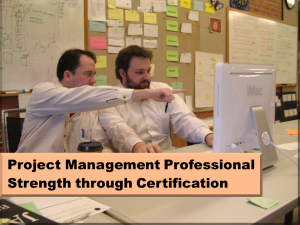 The right certification will not hurt you and will certainly help. VALUE: Certification increases your marketability and value to prospective employers. According to research, in a survey of 1,700 Human Resources and IT executives, most hiring managers rate IT certifications as having extremely high value in validating skills and expertise. FINANCIAL: An individual’s earning potential is enhanced with certification. For example, in comparison, a PMP certification gives you an average of a 19% pay rate advantage. A+ and Net+ certifications by themselves do not necessarily give a financial advantage but open the doors to other technologies that do for those willing to take the journey beyond the basics. Security+ from CompTIA, for example, is the foundation for other security certifications and security is definitely a hot job area. EMPLOYABLE: Certification can give you a hiring advantage over non-certified candidates. Microsoft certifications are hot certifications to have in the marketplace and are proving to maintain their value to employers. If predictions about “virtualization” technology is correct then VMware and the VMware Certified Professional (VCP) certification will be well worth considering to make yourself employable. RETAINABLE: Companies tend to retain certified, skilled, and knowledgeable employees. During difficult times, when employment is harder to come by and keep and the competition is fierce, holding additional IT certifications could be vital to sustaining your present position. PROMOTABLE: Certification opens the door to new careers, job improvement, and advancement. 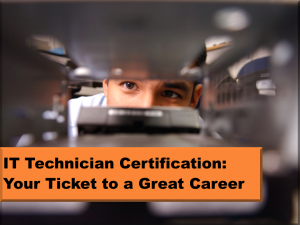 Certifications are one way IT professionals can keep up with current trends in IT technology, build their IT resume and open new doors of opportunity. Look at your career plan as a roadmap with a certification as one stop on the way to your destination. Growth through more certifications add more stops to a better destination. 84 percent of IT professionals consider that holding industry certifications will improve their employment opportunities. In your current position, show that you are seeking to improve yourself in areas that are important to the company. Choose specialized training or certifications in the area you are interested in. Problem solving skills and leadership skills are of great value in IT. The more current your skill sets and comprehensive your certifications, the more likely you will be able advance you career and move up the ladder. PROFESSIONAL: Certification helps you gain unique access to professional group resources. Groups via LinkedIn are open to varying levels of professions and how you are linked to those professions. If you have the knowledge and interest, then there are all kinds of forums for sharing. To check out the course options click here.